The state of Hessen (Hesse in English) lies in western-central Germany. The major cities of this state are Frankfurt am Main, Wiesbaden, Offenbach, Hanau, Giessen, Fulda and Kassel. Culinary specialties vary according to the region, with the north and south showing the influences of neighboring regional cuisines. 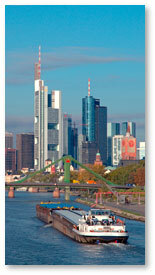 While Frankfurt is Germany’s 5th largest and most international city, and is also the financial and transportation center of the country, it is not the capital of Hesse. Wiesbaden, in fact, lays claim to this title instead. Frankfurt am Main is generally referred to as simply Frankfurt, although am Main, meaning “on the Main river,” differentiates it from Frankfurt an der Oder, the city of Frankfurt that lies in the former East Germany on the Oder river. While the actual city of Frankfurt am Main has only about 655,000 inhabitants, the Frankfurt urban area is home to almost 1.5 million inhabitants and the Frankfurt Rhine Main area has a population of 5 million. Culinary specialties in Hessen vary according to the region. Influences from the neighboring state of Thuringia are found in Northern Hessen, whereas in Southern Hessen, culinary specialties are inspired by the cuisine of the Rheinhessen and Franconia areas. Whatever the area of influence, potatoes and bread figure heavily in Hessische Küche, or Hessian cooking! The original Frankfurter Würstchen, or Frankfurt sausage, is a scalded, smoked sausage (Brühwurst) made with pork contained in a natural sheepskin casing. To cook it, it is scaled in hot water for about 8 minutes, hence the name Brühwurst, and must never be boiled. Typical accompaniments are mustard, bread and horseradish. The Frankfurter Würstchen has been around since the 13th Century and since 1860, its name has been geographically protected so that only sausages made in the Frankfurt area may be called Frankfurter Würstchen! 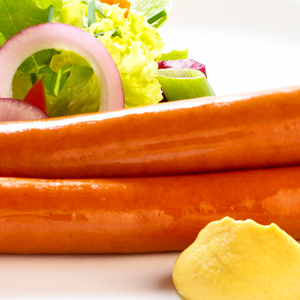 While the Frankfurter Würstchen is made from 100% pork, the Frankfurter Rindswurst is made from 100% beef. It was invented in 1894 by a butcher in Frankfurt and became very popular among the Jewish population of the time since it did not contain pork. The butcher’s shop where it was invented is still in business in the city to this day! Frankfurter Rindswurst is also a Brühwurst and is usually cooked in a Wasserbad (slow cooker) but can also be grilled or fried. It’s also used as a base for the popular Currywurst, which is a sliced sausage covered in a curry-flavored ketchup. A green sauce is a cold sauce made with herbs that traditionally accompanies fish and meat dishes, boiled eggs and potatoes. The Frankfurt Grüne Sauce and the Kassel Grüne Sauce are very regional specialties in Hessen. The Frankfurter version is made from seven herbs, namely borage, chervil, cress, parsley, burnet, sorrel and chives. Sometimes dill, spinach or lovage are also added. The herbs are minced and blended with hard-boiled egg yolk and sour cream, then passed through a sieve and beaten together with oil, vinegar, salt and pepper creating a mayonnaise-type consistency. Frankfurter Grüne Sauce is traditionally served with boiled potatoes or Pellkartoffel, which are potatoes boiled in their skins. It is also typically eaten as a topping for hard-boiled eggs. To make a proper Frankfurter Grüne Sauce, worthy of its name, you really have to use herbs that are grown in certain areas of Frankfurt. These herbs are packed into paper bags and sold in the local markets. A genuine sauce would use only the seven above-mentioned herbs, without the addition of dill. 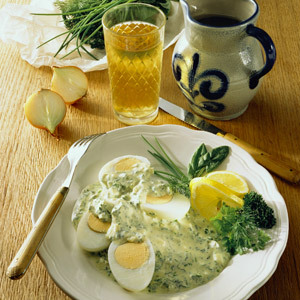 Since herbs are not grown all-year round, there is indeed a season for Frankfurter Grüne Sauce, which, of course, begins on Gründonnerstag (green Thursday), which is the Thursday before Easter (Maundy Thursday), when one traditionally eats green food. The Kassel Grüne Sauce differentiates itself from the famous Frankfurter version in that it uses different herbs, namely borage, parsley, burnet, sorrel, chives, dill and lemon balm rather than chervil, cress and lovage. 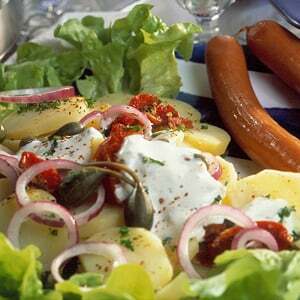 It is eaten with boiled, salted potatoes, Pellkartoffeln or baked potatoes. 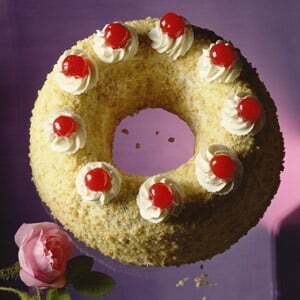 or a Frankfurter Wreath is a wreath-shaped cake from Frankfurt. It consists of a butter cake that is baked into a wreath-shaped form, then split into 2 – 4 layers and sandwiched together with butter cream filling and red preserves or jam. It’s decorated with more butter cream and sprinkled with Krokant, which is a mixture of nuts that have been browned in butter with a little sugar! A perfect holiday treat to satisfy one’s hunger and sweet tooth! Bethmännchen owe their name to the wealthy banker from Frankfurt named Simon Moritz von Bethmann, whose chef, a Parisian confectioner, created these marzipan confections while working as a chef in his home. They are thought to be a variation of the confection Frankfurter Brenten, which date back to the Middle Ages. Bethmännchen are cookies made from marzipan, almonds, confectioner’s sugar and rose water. They are decorated with three almond halves, brushed with egg yolk and baked in the oven. Legend has it that the original Bethmännchen had 4 almond halves, one to represent each of the banker’s four sons. The number was apparently reduced to three when one of the sons died, however this story is not proven. Bethmännchen are most commonly baked and eaten during the Christmas season. Another regional dessert is a Haddekuche, which is a diamond shaped gingerbread! It’s is derived from Hartekuchen, meaning hard cake, since it dries very quickly and becomes hard. The diamond-shaped pattern on the surface of the Haddekuche is similar to the pattern on the side of a typical Apfelwein glass, Frankfurt’s traditional beverage. They are sold in Apfelweinstuben (pubs selling apple wine) in the Frankfurt area by so-called traveling Bretzelbubb or pretzel sellers.